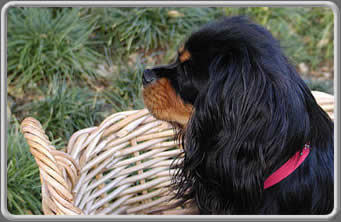 What is a good nutritional plan for an EFS affected Cavalier? Our gratitude goes to Monica Segal, AHCW for writing this article. Due to the fact that there is so little known about the cause of Episodic Falling Syndrome, a dietary link cannot be made with any sort of accuracy. If we consider this to be seizure-like activity, we can consider certain aspects of dietary manipulation that may be beneficial. Please keep in mind that this remains a possibility rather than a proven, established way of helping the dog through dietary modifications. A diet that does not contain red meat is recommended for a dog that has compromised liver function. In cases of an otherwise healthy Cavalier that experiences Episodic Falling Syndrome, the liver is not truly compromised, as evidenced by normal liver values on blood tests. In cases of Epilepsy, where drugs that can be harmful to the liver are often used, it may be prudent to use a liver-friendly diet that does not contain red meat. Does this apply to a dog with Episodic Falling? If liver function is normal and the dog is not taking medications that can compromise the liver, probably not. A diet lacking in red meat won't do harm but it is not likely to help. Consider the information above a little differently if you are feeding a home-prepared diet. Unlike commercial foods from cans and bags, home-prepared diets do not provide added vitamin and minerals. White meats and fish provide very little in the way of B vitamins (important for brain function, digestion, energy, appetite, healthy skin, metabolism of fats, carbohydrates and proteins, function of nervous system, taurine and carnitine synthesis and promotion of red blood cell formation), iron (important for production of hemoglobin and oxygenation of red blood cells), copper (important for bone formation, pigment, and immune function) or zinc (important for protein synthesis, skin health, immune system, and wound healing). When feeding a home-prepared diet that does not include red meats, you must provide a daily vitamin and mineral (made for people, not for dogs) if you hope to give your Cavalier proper nutrition. There is no reason to feed an affected dog a diet that is low in protein. The body requires protein to perform its tasks, including healthy cell turnover. Neither is there reason to feed a high protein diet. Unless the dog is suffering from a disease that demands manipulation of protein amount, there is no benefit to doing so. Puppies can be fed a typical 'puppy diet' whether they are affected by Episodic Falling Syndrome or not. The key here is that puppies have different needs from adult dogs because their bodies are in the building process. However, a puppy, affected or otherwise, has the same nutritional needs, as far as we know today. Fish body oils (not to be confused with fish liver oils) provide Omega 3 fatty acids and have been proven to help reduce inflammation and benefit the heart. There are a variety of fish body oils on the market and most come from farmed fish, high in PCBs and mercury. For this reason, it is critical to stay away from these products and choose wild salmon oil instead. Vitamin E is a potent antioxidant and should be added to the diet, especially when the additions of Omega 3 (fish, fish oils and flaxseed oils are the most common sources) are made. The average Cavalier (15-20 pounds) may benefit from being given 100 IU of vitamin E per day. CoQ10 is a supplement that may also be helpful. While it seems to help people with certain heart conditions, it has not proven to do so in dogs. However, it helps to oxygenate the blood and can improve oral health (focuses on gums rather than tarter). Your dog may benefit from 30 mg daily. The feeding schedule does not seem to affect most Cavaliers with Episodic Falling Syndrome but in some cases, the difference has been notable so it may be worth trying. Some clients have reported this as well so I will use our Cassie as an example. She does best when fed three times daily, meals being spaced about six hours apart. She is steadier on her feet when on this schedule and her episodes have been milder and less frequent. The emotional attachment to a specific method of feeding (raw vs. cooked foods vs. kibble) has not proven to be based on proof of better health. While one method may be better than another, we have not experienced several generations of Cavaliers living longer or better lives due to our choices. Unless and until this occurs, your chosen method of feeding should be based on what your dog tolerates best. When choosing to feed any home-prepared diet (raw or cooked), it becomes crucial to know the nutrient values of the diet rather than guessing. This is the case for all dogs but especially the Cavalier because here, we are trying to provide optimal nutrition to support heart and brain function. By reviewing the information above as it pertains to B vitamins, you can see that a diet lacking in just these vitamins alone is enough to set off a serious avalanche of reactions over the longer term. The middle ground would be to feed a high quality dry or canned food and make additions of fresh foods. This can be easily done by sharing some of your family's healthy foods with your Cavalier. Baby carrots and fresh, over ripened fruits make nice treats. Eggs provide the highest quality protein and small amounts can be added to the food bowl. Lean pieces of chicken, turkey, fish or any other meat may be a boost to the food offering. The key is to remember that commercial diets can be unbalanced if we go overboard with additions of meats. Rule of thumb is to add just a few bites of meat to the food bowl. Vegetables and fruits can be fed freely but keep in mind that your dog cannot digest cellulose. Fruits and veggies contain cellulose so you'll need to crush these foods by putting them through a food processor until you have something that resembles mush. Fruits and vegetables fed as treats don't require preparation but too many of them will likely cause diarrhea. Best bet is to give small amounts, increasing the quantity only as you see that your dog tolerates these additions well. This dietary article may not be reproduced by any means without the express permission of the author.